ABS-CBN opened 2019 on a high note as viewers nationwide tuned in to its news and entertainment shows, making the network hit an average audience share of 45% in January, or 15 points higher than GMA’s 30%, based on Kantar Media’s data. ABS-CBN led in Mega Manila where it scored 37%, beating GMA’s 28% and in Metro Manila, where it registered an average audience share of 44% against GMA’s 23%. ABS-CBN likewise led in Total Luzon, where it garnered 40% versus GMA’s 32%, in Total Visayas with 54%, or 29 points higher than GMA’s 25%, and in Total Mindanao with 55%, while GMA only scored 26%. 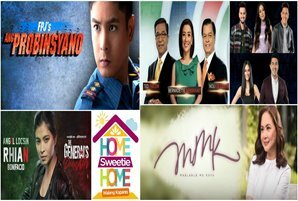 ABS-CBN programs ruled the top 10 list of most watched programs in January with “FPJ’s Ang Probinsyano” (39.1%) on top. Also part of the top 10 are the Kapamilya network’s newest shows, Angel Locsin’s “The General’s Daughter” (32.8%) and the new reality talent show, “World of Dance Philippines” (30.8%) followed by ABS-CBN’s flagship news program “TV Patrol” (30.2%). JoshLia’s “Ngayon at Kailanman” (28.7%) ended its run strongly, while “Maalaala Mo Kaya” (24.3%) continued to rule its timeslot every Saturday. “Halik” (23.2) sustained its high viewership, while the comeback of “Minute to Win It: Last Man Standing” (22.6%) earned its place in the top 10. Completing the list is the values-laden program “Wansapanataym” (22.4%). The Kapamilya network was also successful in conquering the morning block (6AM-12NN) with an average audience share of 37%, compared to GMA’s 27%; in the noontime block (12NN-3PM) with 42%, versus GMA’s 31%; and in the afternoon block (3PM-6PM) with 44%, beating GMA’s 33%.